How historic is your coffee table? 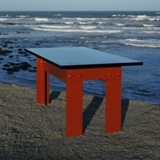 Check out a new coffee table made from original steel from the Golden Gate Bridge incorporating the use of new steel with pieces of the Golden Gate Bridge's original 1930's pedestrian handrail. Its predecessors - the Occasional and Accent tables - sold out quickly and this coffee table is limited to 140 pieces with a retail price tag of $2950, each is numbered and comes with a Letter of Authenticity.